With temperatures continuing to plummet, we have scoured our Pinterest boards for 10 of the cosiest chalets in remote locations, including a 350-year-old hut in the Swiss Alps and a ski cabin at the top of a slope in Quebec. In line with strict local planning guidelines, French practice Studio Razavi designed this home to blend in with the traditional chalets of the French skiing region of Auvergne-Rhône-Alpes. Overhangs on the front facade help to protect the base of the building from snow accumulation. Precariously balanced on the top of a popular skiing site in Quebec and bordered on each side by jutting rocks, this timber-clad chalet is designed by Patkau Architects. The angular shape helps snow to slide off of the roof, while optimising views across Canada's Whistler Valley. Miami-based Oppenheim Architecture was responsible for renovating this Colorado ski resort chalet and restoring its original rustic charm. The chalet is characterised by rough textures and finishes, in line with the Japanese principle of wabi-sabi, which embraces imperfection. This ski chalet designed by Canadian firm Robitaille Curtis is the second on our list to perch at the top of a ski slope, offering panoramic views of the region. The home is among the highest in the Laurentian Mountains, standing at an elevation of 2,435 feet (742 metres) above sea level. The tar-coated timber that clads this Californian ski chalet by Mork-Ulnes helps to protect it from adverse weather conditions and insects. The interiors feature modern Scandinavian-style furniture and a lighter coloured timber, to make the space feel welcoming and bright. 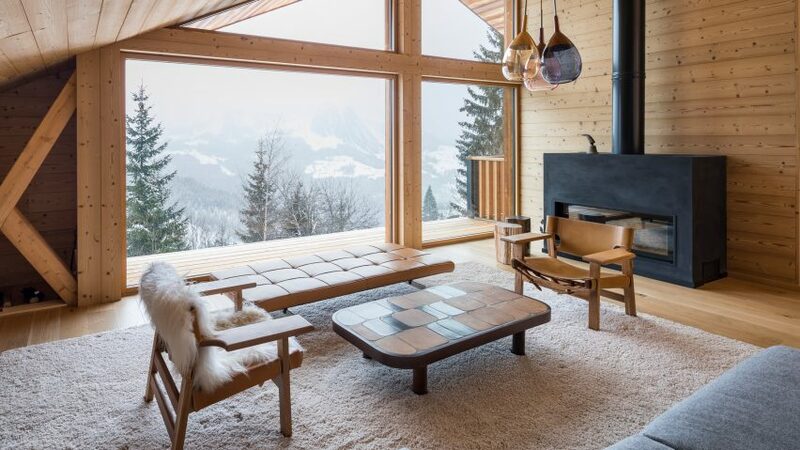 This idyllic snow-covered chalet in western Austria was designed by Bernardo Bader Architects to make the most of its prime location. Straddling the top of the Glatthorn and Zafernhorn mountains, the home has varying sized windows that frame views of the rugged landscape. Proving that not all chalets are in snowy locations, this family weekend home by Hammer Architects is located within a hilltop woodland clearing in Cape Cod. Floor-to-ceiling glazing wraps around three walls of the home, providing the residents with scenic views of the forest in all seasons. Prague-based Znameni Ctyr proposed a design that combined traditional and contemporary details when replacing a formerly run-down chalet traversing the Czech-Poland border. The architects referenced the traditional staggered profile of Alpine chalets to create a building that angles outwards at both ends. Slovenian studio Kombinat transformed this Alpine chalet to function as a modern weekend house for a family. The two-storey wooden hut boasts concrete wings and timber shutters that make the building resemble a wooden box when closed. Dutch architect Christian Müller was tasked with splitting this 350-year-old house in the Swiss village of Vella into two apartments. Challenged with modernising and making the structure adaptable for future generations, Müller combined raw concrete with distressed wood for the interior.